One of my favorite aspects of the homebrewing and beer enthusiast community are the endless opportunities to meet new people and share beer you might not have the chance to try otherwise. Bottle shares have become increasingly popular in Chicago and beyond, between groups of friends as well as through online communities like the Chicago Craft Beer Enthusiasts and Chicago Beer Society's First Thursdays. The beauty of bottle shares is the ability to try small samplings of a number of beers in one sitting with the objective of broadening your palette versus having to commit to a full pint or 22oz bomber of one beer. This format has truly helped me discover on a deeper level what styles of beer I like and want to try more of. Over the last few days I've been staring down my beer collection, trying to narrow selections to bring to Wednesday's Chicago Beer Gals bottle share. It gave me a chance to reflect on some of the great beer I've had the opportunity to drink over the last year. Below are a few of my favorites. I've also asked CHAOS Brew Club's Ken Getty, who is much more active with the group tastings and beer trading aspect, for his top 5 as well. 1) 2012 Barrel Aged Shipwreck Porter - Arcadia Brewing. Rich, dark coffee, toffee, vanilla with a silky smooth finish. Available in 12oz bottles, this is a warmer that might be hard to share! 2) Pumpkinator - Saint Arnold Brewing. When compiling our massive list of competitors for The Great Pumpkin Beer Challenge, we were able to trade for a bottle of this full-bodied stout with notes of cinnamon, chocolate and roastiness which went on to win the #1 spot. 3) Heady Topper Imperial IPA - The Alchemist. One of the most sought after IPAs of 2013, we had the East Coast connection to smuggle a few cans back to Chicago. A hop bomb with layers of citrus, peach and tropical fruit that carries through from the aroma through the full bodied finish. 4) Love Buzz Saison - Anchorage Brewing. This bottle brewed in Alaska was brought to share on Thanksgiving Day. Brewed with hibiscus and peppercorn, aged in pinot noir barrels it satisfied both the beer and wine drinkers at the table and was quite a conversation piece between the two. 5) Straight Jacket Barleywine - Revolution Brewing. Obtained on it's release date in Dec 2012, it took almost a year to break it open for the right occasion with friends. Aged in Woodford barrels, it was full bodied with notes of bourbon, vanilla, dark fruit and definitely worth the wait. I am a bit of an old soul and I think I enjoy bottle shares so much because of the fact that everyone gets together for a common purpose, enjoys each other’s company while small talking and when a new beer is poured completely enjoys the moment. Most gatherings involving beer when friends get together seems to have either a stereo, sporting event or television nearby vying for your attention…not so, with bottle shares. I find bottle shares are typically about sharing stories, making new friends, and new-shared experiences. 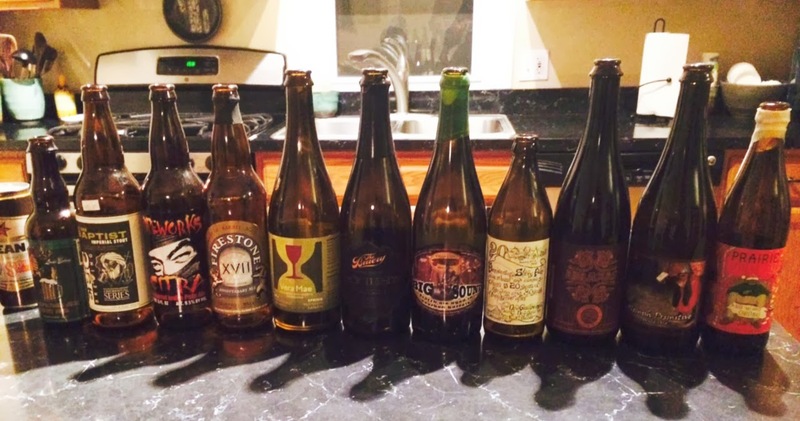 While curating my list of Top Five Bottle Share Beers of 2013, it brought back many memories of good friends & good times. I hope you have similar experiences soon! 2) 2012 Eclipse Stout Series – Fifty Fifty Brewing Company (Grand Cru, Elijah Craig 12-yr, Elijah Craig 20-yr, Mellow Corn, Rittenhouse Rye, GHS Special Blend, Evan Williams, Old Fitzgerald): A friend shared this monster Horizontal set from 2012 at a CHAOS Brew Club Bottle Share with close to 40 people! 3) Barrel Aged Last Kiss in Buffalo Trace Barrels – Pipeworks Brewing Company: Strong Mike is the “Master of Barrels” at Pipeworks and he has been knocking it out of the box his first three barrel-aged beers…if you have the chance jump one these beers. First released to “Friends with Benefits” members in late 2013 and slotted for a 2014 limited release. 4) pseudo Sue – Toppling Goliath Brewing – This was a holiday bottle share put on by members of the Chicago Craft Beer Enthusiasts Facebook group…good times and good people! 5) Everett – Hill Farmstead: A friend came back with an SUV full of Vermont beer and I happened to be on the receiving end of his generosity when he came back to Chicago.